prior to the scheduled arrival date, the hotel will charge 50% of the value of the entire booking. The price applied to your booking corresponds to a single occupation (2 persons). It is not allowed to enter the property with a pet. Check in: as of 15.00. Check out: before 13.00. Late check out: until 18.00 without any extra charge (depending availability). Welcome to your next holiday destination! Spend your time in Tulum on a unique location. Surrounded by nature you can discover our cenote, relax on the beautiful beach and enjoy delicious food, all in a never-before setting in Tulum. MangleX offers you authentic, friendly service and nights underneath the stars you will never forget. Four luxury cabin suites located at the popular Tulum Beach area. Our cabin suites are elevated above a beautiful mangrove forest. The suite with queen size bed is solar-powered and comes equipped with a beautiful bathroom, mosquito nets, wifi reception in the bar area and hot / cold water showers. 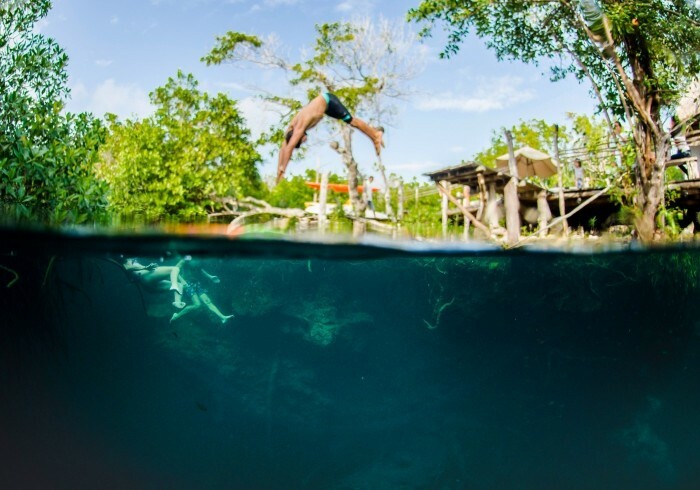 In a unique Ecosystem consisting of mangrove forest, cenote and beach. Living in balance with nature is something we value. Our energy supply comes from the sun, our water supply comes from the cenote (and the waste water is filtered and pumped back) and most of our constructions are build with local materials to ensure we are in balance with the nature surrounding us.